5/19/16 SAN FRANCISCO — Someday, the dusty back shelves of America’s warehouses could be replaced by UPS and SAP-enabled 3-D printing. The companies on Wednesday said their goal is to transform the now ad hoc realm of industrial 3-D printing into a seamless, on-demand manufacturing process, from order to manufacturing and delivery. “We don’t think this is going to take over manufacturing anytime soon. But we do think it’s going to be a disruptor much in the same way that online retail has disrupted retailing,” said Hans Thalbauer, senior vice president for extended supply chain at SAP. To do that, the package-delivery company and business software company are working with an Atlanta-based company that has Louisville, Ky. production facilities called Fast Radius to do 3-D printing of parts. They made the announcement at the Sapphire Now conference in Orlando. Customers will be able to place 3-D printing orders on the Fast Radius website, which will send them to one of UPS’ more than 60 stores outfitted with 3-D printers, or Fast Radius’ production facilities in Louisville. Where the order is sent will depend on speed, geography and the product quality the customer requires. SAP customers will be able to use the system to digitize and simplify the production part approval process. “We would help them decide when it’s a better financial decision to print on demand or to pull from stock,” Thalbauer said. While 3-D printing is often seen as a realm for kids’ projects and plastic mock-ups, modern techniques make it increasingly possible to print complex metal or plastic objects that can range from aviation fuel-injection nozzles to precision medical devices. “We’re ushering in the next century of the supply chain,” said Alan Amling, a vice president at UPS. 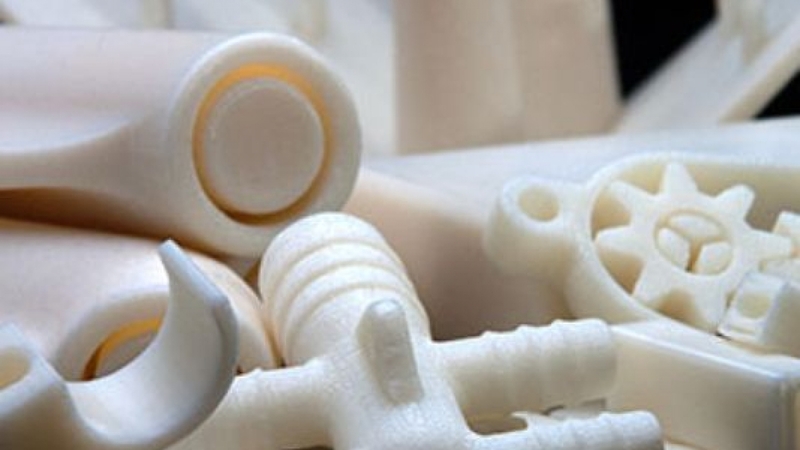 The company believes that 3-D printing is rapidly moving from the hype phase to an important part of manufacturing. According to a study published in April by the Manufacturing Institute, 71% of U.S. manufacturers are using 3-D printing technology in some way. While the majority still use it mainly for prototypes, almost 7% are using it to produce end products. SAP’s part is helping businesses decide which items in their inventories best lend themselves to that type of production. Any part needed in large numbers will be less expensive to manufacture. But items that are seldom needed, or needed in small numbers, can often be produced more cheaply through 3-D printing, said Pete Basiliere, a 3-D analyst with Gartner. For items that lend themselves to 3-D printing, a company can basically draw two cost curves: one for manufacturing, and one for 3-D printing and see exactly the number below which 3-D printing makes sense. That number is rising every month, said Bill Muir, chief operating officer for Jabil, a manufacturing services company based in St. Petersburg, Fla.
“Between the ongoing push to mass customization and instant gratification, we have been amazed at how quickly that intersection point continues to drop, and 3-D printing becomes more cost competitive,” Muir said. The partnership between SAP, UPS and Fast Radius (formerly CloudDDM) will help companies connect their front and back ends to create a seamless process, Amling said. The low-hanging fruit for the partnership will be the most seldom-used parts. Many firms have tens of thousands of parts stored all over the world, a good portion of which rarely if ever turn over but are kept in stock just in case, he said. Fast Radius is based in Lexington, Ky., near UPS’ main air hub. That means that for parts printed there, the company can manufacture up to 12:30 a.m. and still hit the final UPS ship time of 1:30 a.m., getting the part into the air and to any state in the union by the next day. Even if small, the numbers are big, said Amling.